It took eight years for former advertising consultant Patricia Conoway to call her first book ready for the public. 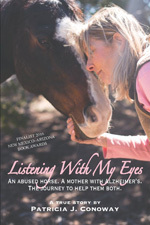 Her memoir Listening With My Eyes: An Abused Horse. A Mother With Alzheimer’s. The Journey To Help Them Both. was published in 2015. You’ll find Patricia on her website PatriciaJConoway.com and on Facebook. Why did you write Listening With My Eyes, and who did you write it for? I wrote Listening With My Eyes to help caregivers—people in the same situation I found myself: with an aging parent descending into Alzheimer’s that had lost her ability to care for herself, or to communicate verbally. Prior to being a caregiver, I’d purchased my first horse, who’d been abused, drugged and had no use for humans. Ignoring advice to put her down, I decided to learn how to understand my horse Dream and gain her trust, which entailed learning her body language and building upon that learning. This in turn helped me better understand my mother and her body language. While we all incorporate body language into our dialogues, it is often on a subconscious level. It took a problem horse plus determination to push through fear—hers and mine—plus many challenges that achieved the goal of feeling safe then having fun with her. My mother exhibited fear not dissimilar to Dream’s as her memory and ability to function waned. I also wrote the book for animal lovers. I believe there is much we can learn from them if we take the time to “listen” and much we can learn about ourselves through them. Hopefully we become better humans because of them. That being present, aware, and “in the moment” provides the “listener” with more and greater information that is extremely empowering. This is increasingly difficult with all our attention-grabbing and distracting computers, phones, etc. Paying attention to non-verbal communication (body language) in any sentient being not only provides the “listener” with greater comprehension, it also empowers the other being in the dialogue, making for richer, deeper, often profound understanding and empathy. Along with completing it and seeing the final product, receiving feedback in emails, calls, and letters thanking me for writing it and for sharing my story. When I give talks or do book signings, people want to share their stories with me, ask for my advice, give me a hug and often buy the book! I’ve made new friends, met interesting people, and found the entire writing and publishing experience, though often challenging, well worth the effort. When did you know you wanted to write your story? During the process of writing Listening With My Eyes, it must have been difficult to relive some of your experiences. Did you ever feel scared of something you were writing or of revealing yourself through the work? It was difficult and sometimes painful to relive some things, mostly the caregiver part. There were unbelievably sweet, tender, and sometimes agonizing things I experienced, along with great “aha” moments, and profound comprehension resulting from self-examination. Revealing myself wasn’t hard, as my goal was to help and empower others in similar situations. Moving forward from the emotional stuff that accompanied the memories was hard. I took weekly, sometimes monthly, breaks but forced myself to push through when I felt able, because I’d committed to completing this project. 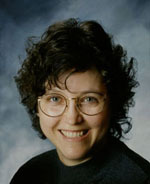 I also had a great editor who ushered me through items that were better left unsaid, or stated more succinctly or differently, which allayed my fears. From beginning to finished product it took eight years. I self-published, because I wasn’t prepared to wait to get my message into the world. After it was “finished,” I asked friends to read and edit, then hired a professional editor and made extensive revisions. Re-edited and proof read again, made more revisions. A friend did the fabulous photography for both covers. I lucked out with a great graphics designer who also edited, along with designing it. The editing/revising/re-editing/graphics work took a bit over a year. Was there anything surprising you discovered while doing research for Listening With My Eyes? Many things, mostly about Alzheimer’s. If not addressed/abated within a few decades, it will bankrupt Medicare and Medicaid. It has touched almost everyone in this country in some way. It is on the increase because of aging baby boomers. The horse research was hands-on. Though I’m no longer a novice, I continue to be amazed at their intelligence, curiosity and sensitivity. I continue to learn from them. That my book moves people, sometimes to tears, but gives them hope and optimism while they face their own challenges with the aging and death of a loved one. Also, my honesty about how adverse, sometimes painful situations, almost always result in making us stronger, perhaps more capable, empathic human beings. Do give yourself breaks, but keep your eye on the ball. You’ve no idea the impact you might have on another person or persons with your own unique story and way of telling it. Don’t let anything or anyone get in the way of sharing your thoughts, story, experience. A coming-of-age story about a bright, ambitious young woman who perseveres with her goals in spite of great adversity, disillusionment, and heartbreak. That it’s never too late to begin writing a book (or undertake any project) and never too late to finish it. That you will personally expand and grow when you do it. This can be life changing. Take that first step. Thanks for reading, Penny, and for commenting!